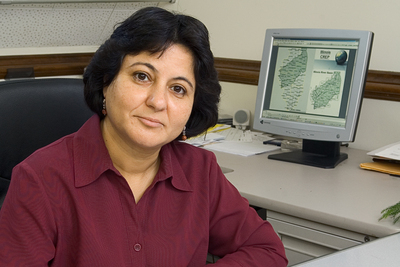 Madhu Khanna is a professor of agricultural and consumer economics at Illinois. Media reports on two studies published in the journal Science in February indicated that biofuels being produced today could actually contribute to an increase - rather than a decrease - in global greenhouse-gas emissions. Other experts are concerned about long-range social and economic consequences that may result when farmers shift from production of crops for food to crops for fuel. Madhu Khanna, a professor of agricultural and consumer economics at Illinois, was among a panel of experts who considered these issues during a recent roundtable discussion on Sustainable Biofuels, Gender Equity and Human Security. She was interviewed by News Bureau editor Melissa Mitchell. How would you characterize the "food vs. fuel" debate that is heating up in many quarters? The food vs. fuel debate is real and can only be expected to intensify in the near future as countries continue to expand the use of food crops, like corn and soybeans, for fuel production. With limited resources of arable land, a growing world population and growing food demand as incomes increase, we have to make choices about how much of the land should be used for fuel production as compared to food and feed production. Corn ethanol production in the US has increased almost threefold since 2005 and uses nearly a fifth of our current corn production. Over the same time period we have observed a doubling of corn prices despite an unprecedented expansion in corn acreage in the US. This has been accompanied by a corresponding reduction in acreage under soybeans and wheat in the US which has led to rising prices for these crops as well. The recent Energy Bill sets ambitious mandates for renewable fuel production of 36 billion gallons annually by 2022. Of this, 15 billion gallons is expected to be corn-based ethanol; this would represent less than ten percent of our annual gasoline consumption in the US and require using 50 percent of our current corn production for fuel production. Corn exports are expected to decrease and world prices of food and feed are likely to rise even further with potentially adverse impacts on net food importing developing countries as well as on the poor in urban populations. The ability to increase crop yields per acre and to bring degraded land back into crop production in other countries will help alleviate this food vs. fuel trade-off. By some estimates, 90 percent of ethanol distilleries popping up across the United States are corn-based. Besides corn, what are some of the other food crops being used - or considered - to produce ethanol and other so-called "first-generation" biofuels? Any feedstocks that are rich in natural sugars or starch which can be readily converted to sugar can be use to produce ethanol. Currently the feedstocks being used include sugar cane in Brazil, sugar beets and wheat in Europe and corn in the United States. Given the risk that an emphasis on growing these crops for fuel could squeeze out production for food, should we be using them for fuel at all? To the extent that corn-based ethanol is used as a gasoline additive and an oxygenate it is better than the alternative chemical Methyl tert-butyl ether (MTBE) used in the past which was found to cause groundwater contamination and has now been banned. However, the production of corn-based ethanol is land intensive and requires considerable inputs of fossil energy. Expanding corn acres also exacerbates nitrogen fertilizer use and nitrate run off that can adversely impact water quality. Moreover, while a gallon of corn-ethanol has lower greenhouse gas intensity than an energy equivalent gallon of gasoline, it may indirectly raise overall greenhouse gas emissions if other countries expand their arable land by deforestation or tilling of virgin grasslands to compensate for reduced exports of corn by the US. Given the questionable environmental benefits of corn-based ethanol, the large diversion of corn from food/feed that it requires and the limited potential to rely on it to achieve meaningful independence from foreign oil there is a need to rethink our current policy efforts towards promoting its production. What are some of the "next-generation" alternatives that are being explored? Which hold the most promise? The "next-generation" alternatives to corn ethanol include dedicated energy crops, such as Miscanthus x giganteus and Switchgrass, crop residues like corn stover and wheat straw and municipal wastes. These feedstocks can be used to produce ligno-cellulosic biofuels. Miscanthus and switchgrass are high yielding perennial grasses with low input requirements that can be grown under a wide range of growing conditions in the midwest and southern regions of the US. They have the potential to more than double the gallons of ethanol that can be obtained per acre and are expected to have a significantly lower greenhouse gas intensity than corn ethanol. These grasses also reduce soil erosion and nitrogen run-off. However, the commercial viability of converting these next generation feedstocks into biofuels is highly dependent on technological breakthroughs that are still in the pipeline.